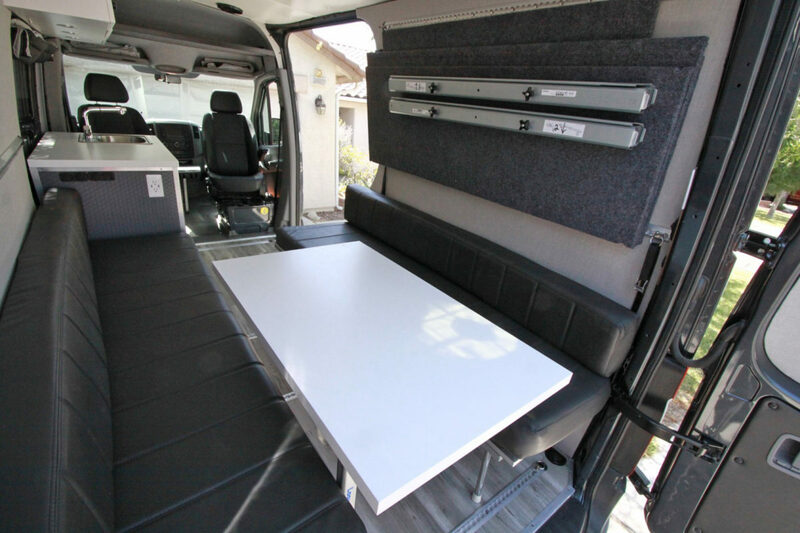 Platform beds are one of the most common setups in vans because they make good use of a small space. 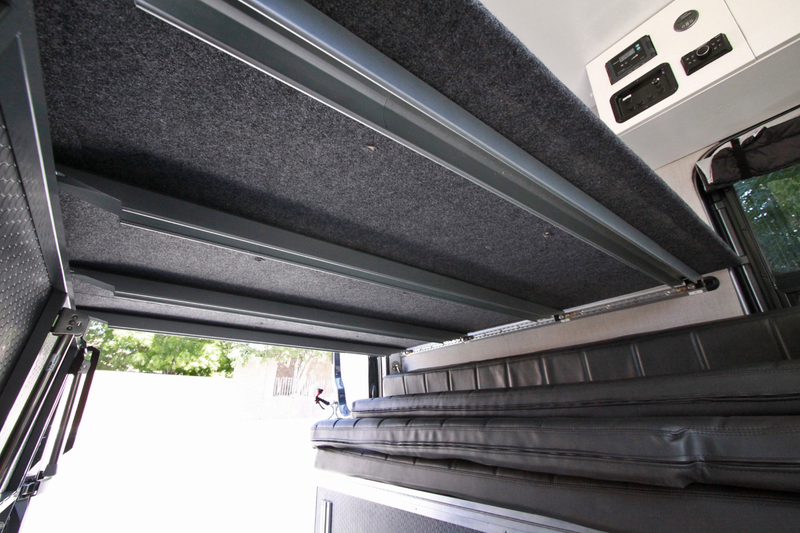 They allow for a garage to securely store bikes and gear while sleeping. 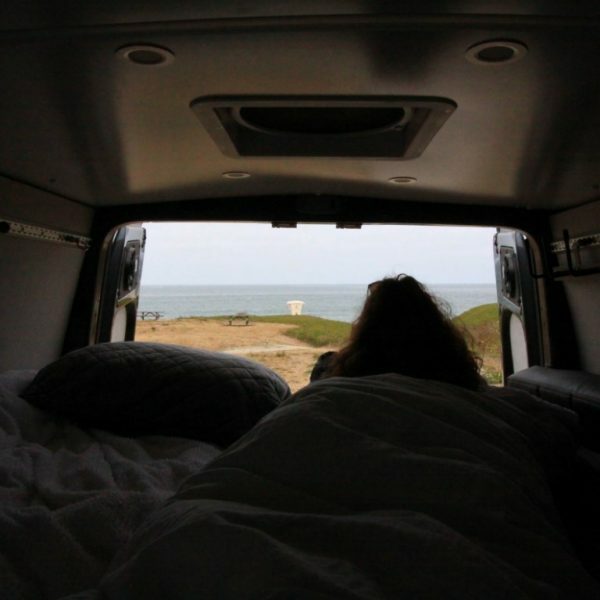 Although we already had a dinette/ bed in our van, we wanted a removable platform bed for this reason. 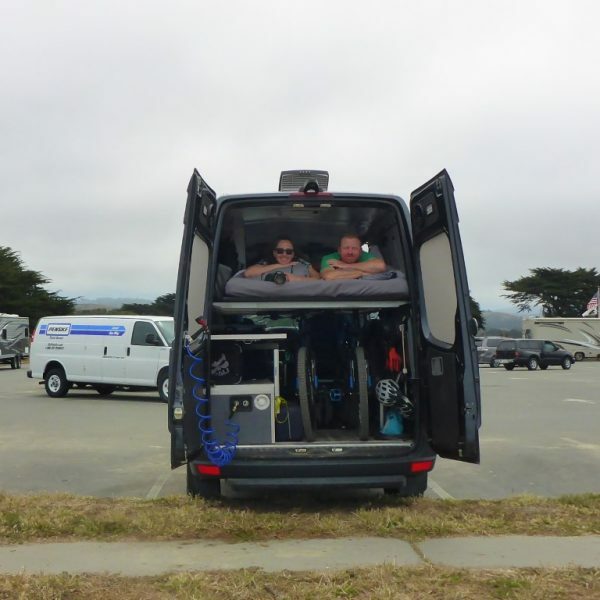 Not all of our trips would include our mountain bikes, but we would absolutely need the security when parked. 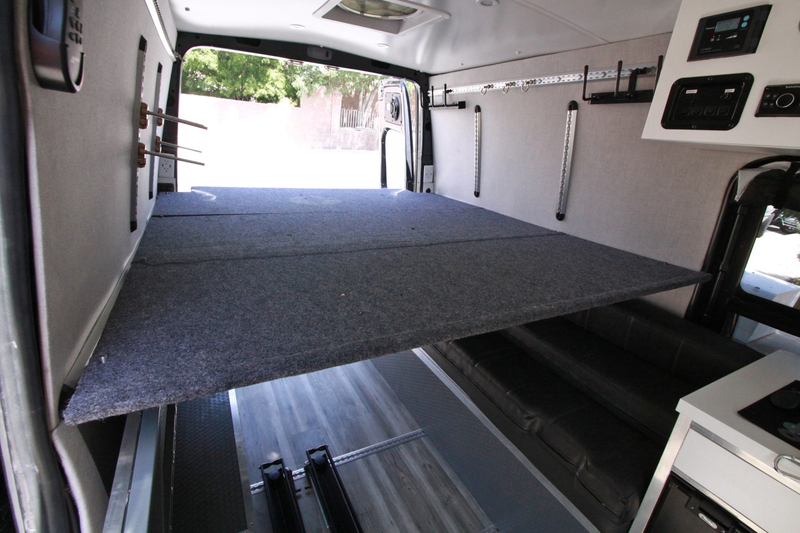 There aren’t many platform bed kits out there for the do-it-yourselfer. Most kits I found are very expensive ($1000-3000) and you still have to install and design parts of it yourself. 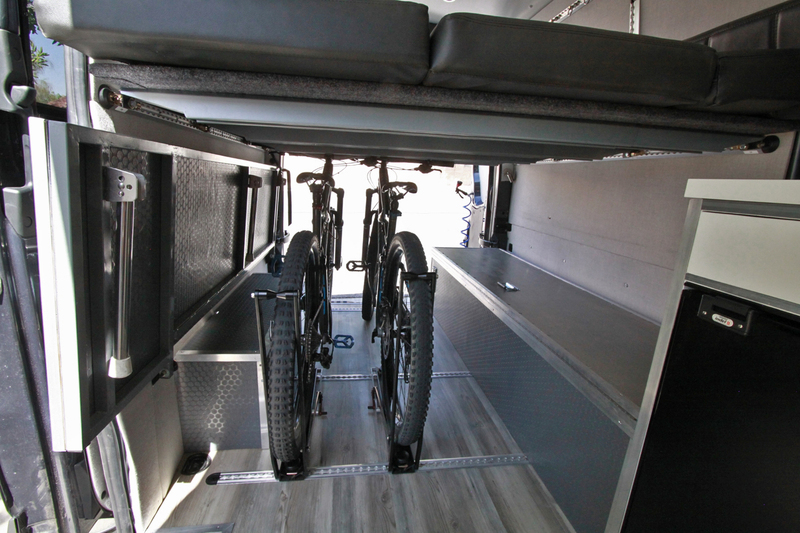 The challenge with building a platform bed is it needs to be strong enough for two people, yet be lightweight and slim in design in order to stow away and clear the bikes below. Most builders tig weld 1×1 aluminum square tubing for the frame and then use some sort of upholstered plywood paneling on top. Many of them don’t even stow away, but for those that do, they mount on rather bulky wall brackets. I had yet to find a setup that works for us or is even in our price range. Below are a couple of options I considered. 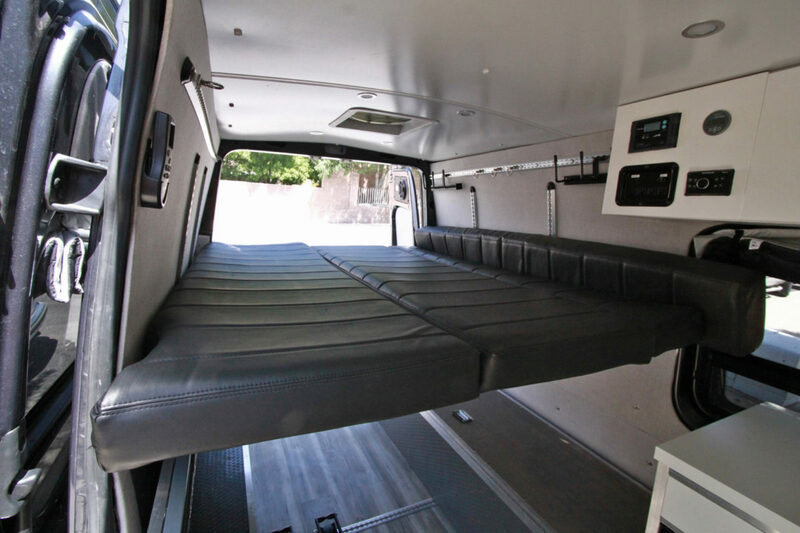 The best-manufactured setup I found is RB Components panel bed but it’s still a bit too bulky for our needs and is about $3000. 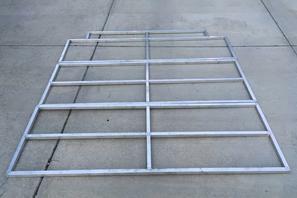 Overland Sprinters makes a very nice aluminum frame for the DIYer for about $900 however, it’s up to you to make the platform material and come up with a way to stow and lock it to the rails. By the time you add up material and tig welding equipment, this is actually a decent price. It’s still more than I wanted to invest in this project though. Time to Build it Myself! When I can’t find anyone that sells what I need, I build it! 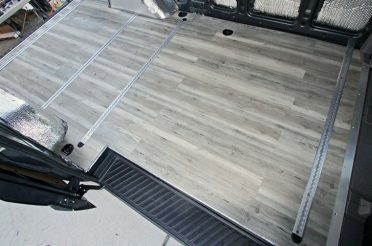 The biggest hurdle was coming up with a strong, yet lightweight beam or frame that would support the bed panels. 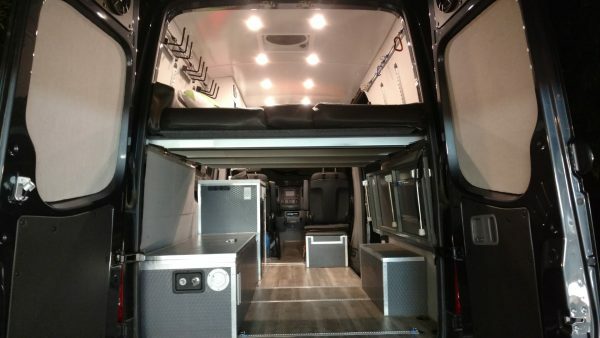 In all of my hours of internet research, I came come across a guy on the Sprinter Buildout group on Facebook that used Skorva Ikea bed supports. They sell for $10 each in the Ikea stores or $30 each on Amazon. I immediately knew this was the solution. 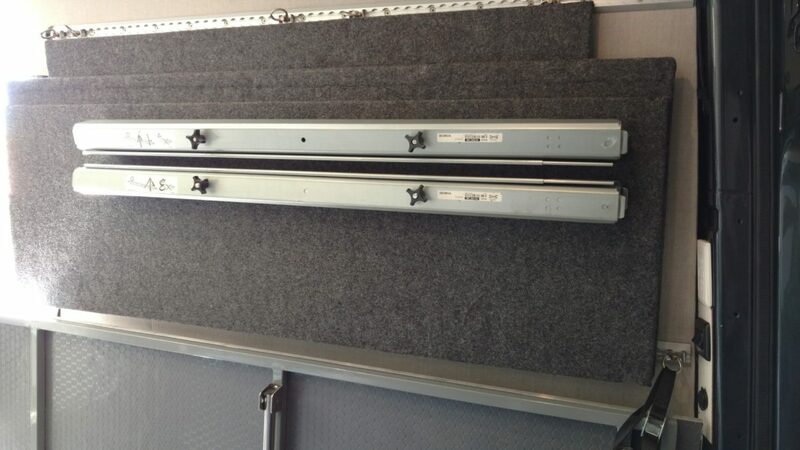 I wanted to attach 4 beams across the van to our existing L track on the walls. 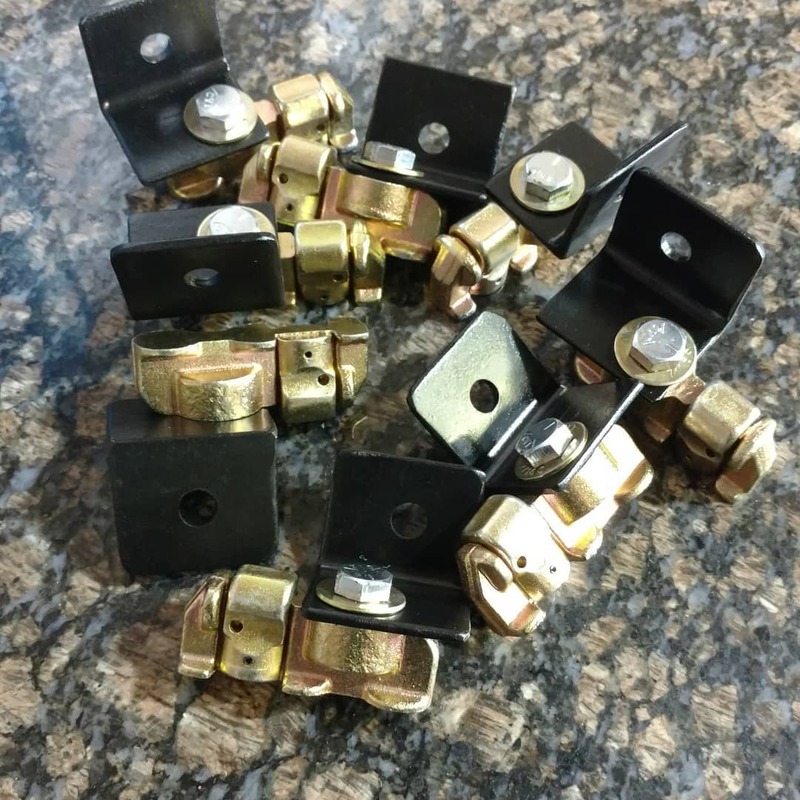 They would be easily removable by means of a quick disconnect double stud fitting. 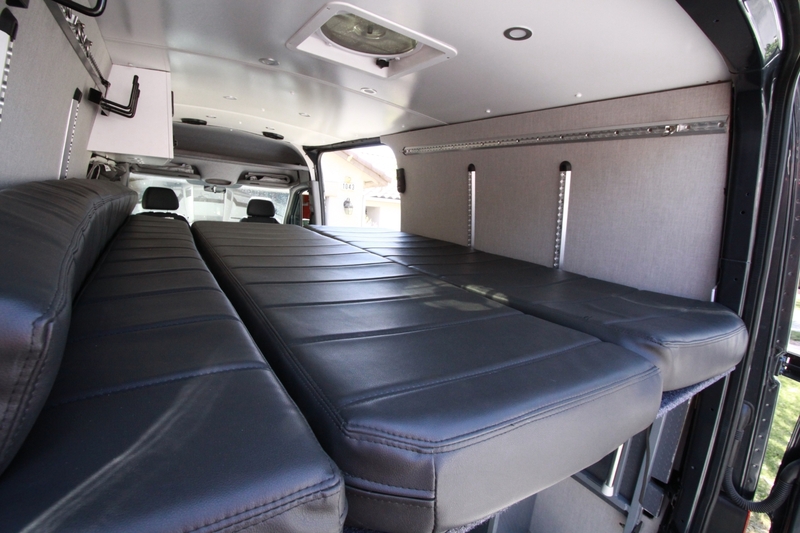 Three upholstered ½” plywood panels would be the platform. 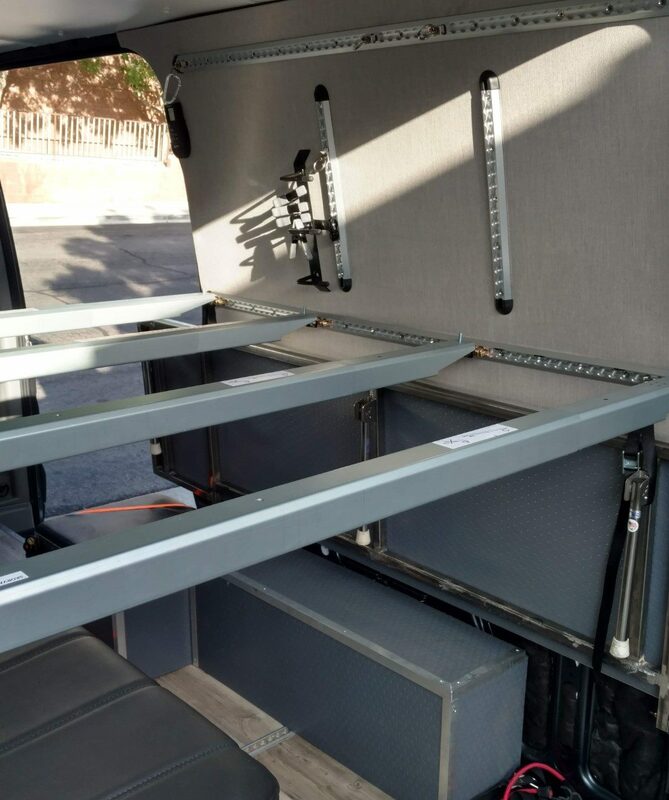 The first step to building this bed system was to come up with a way to attach the Ikea bed supports to the L track. 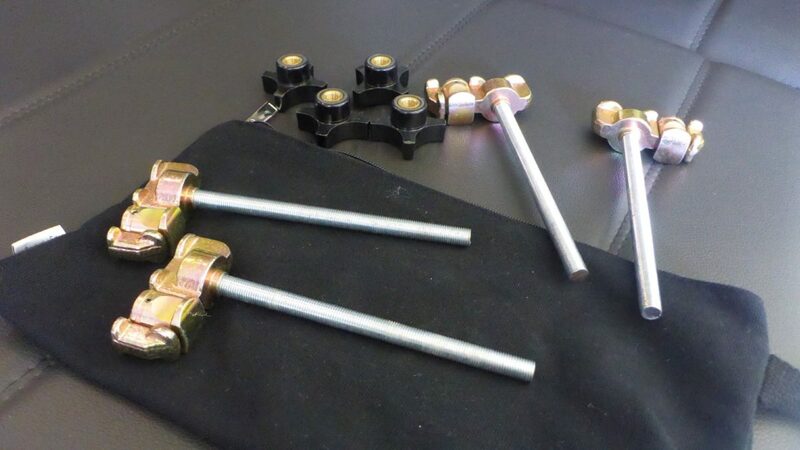 I cut eight, small L brackets out of angle steel and mounted them to the double stud fittings with 3/8-24 bolts cut to custom length (approx 3/4″). I welded 3/8-24 bolts into the brackets for the platform panels to slide down on to and hold them in place. 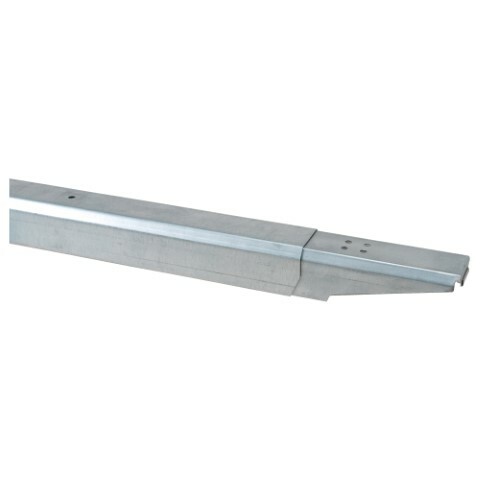 After drilling new holes at the ends of the four Ikea Skorva beams, they were set on the brackets. Three panels were cut out of ½” birch plywood. 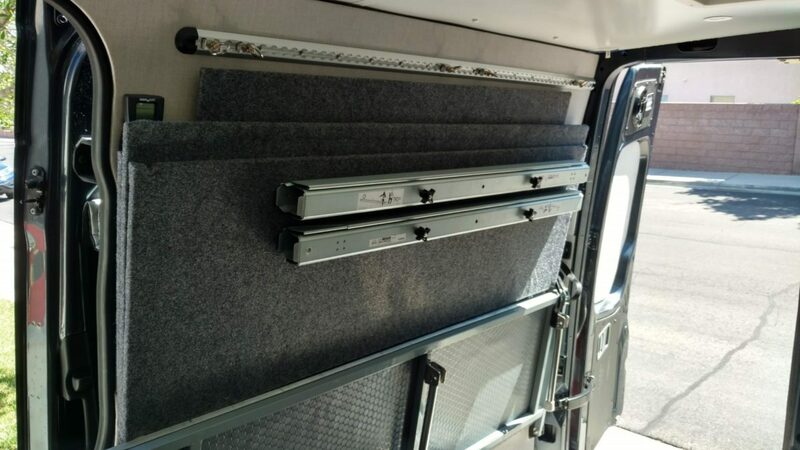 They were test fitted in the van and some minor adjustments were made around the mounting points. Thumb screws hold the panels securely in place. 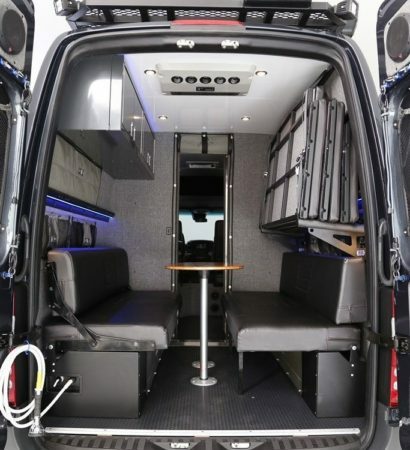 Once fitted and I was happy with how they mounted in the van, I covered them in speaker box carpeting. This carpet is very durable yet easy to work with. I used 3M90 to glue it down. 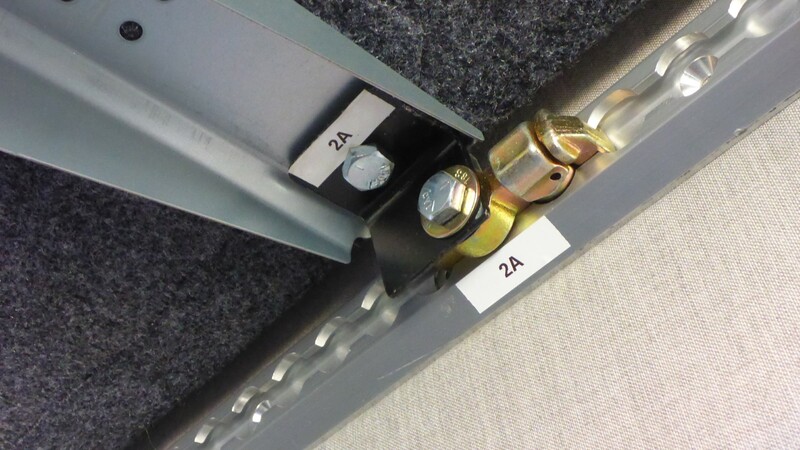 The three panels slide over the bolts and set on the beams. This is what the underside looks like. I labeled each bracket and the corresponding location on the L track since not every single bracket is exactly the same. It makes for a quicker fit without having to adjust anything. For the mattress, we use the same cushions from our dinette/ bed. 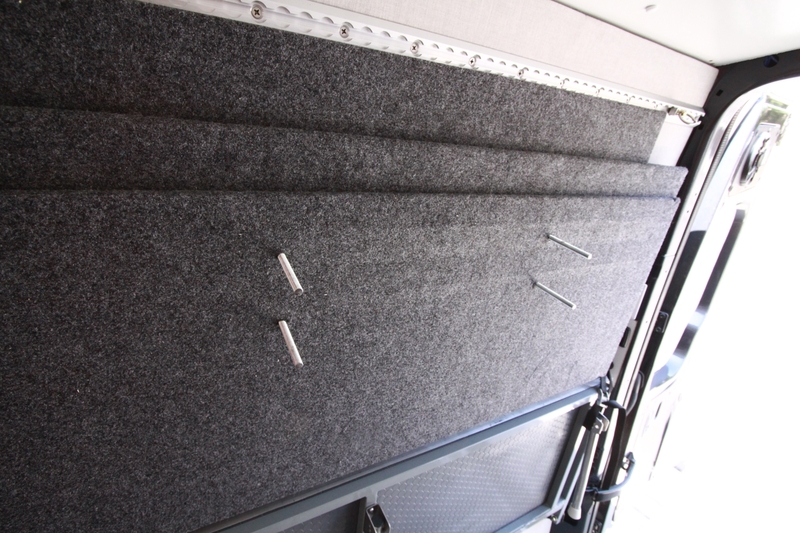 The last narrower cushion gets put in on its side due to the curvature of the walls. Some have asked me if the gaps between the cushions are felt when laying down. You can’t even notice them. 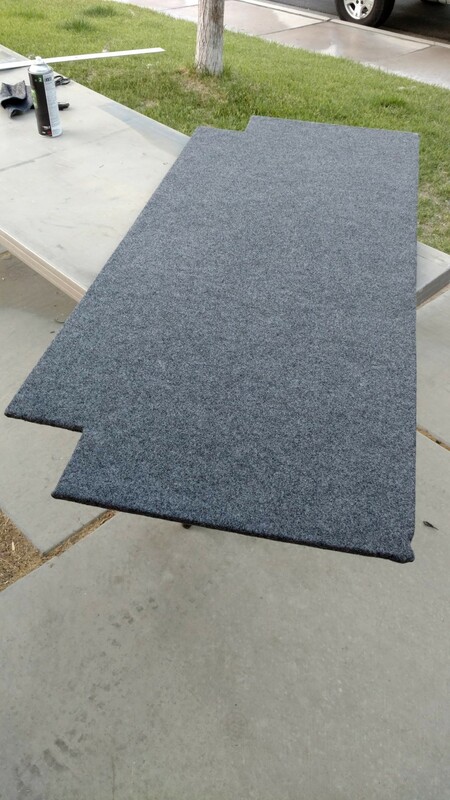 The memory foam cushions push together when any weight is put on them. 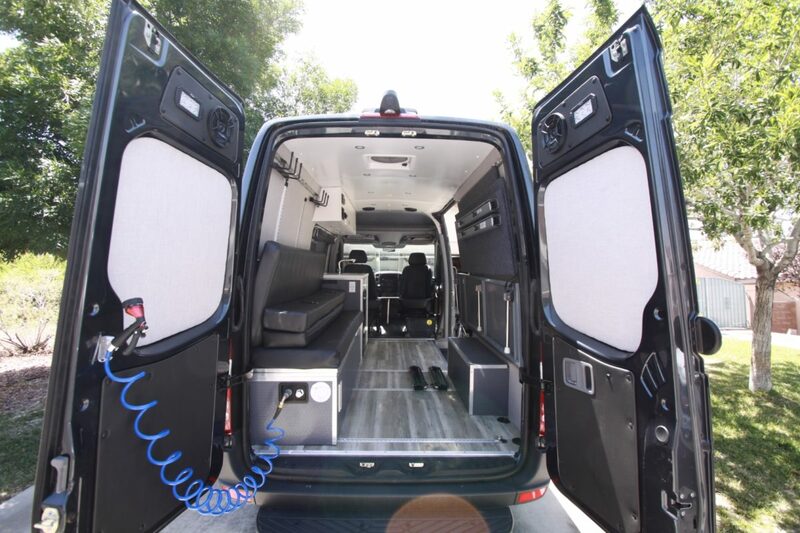 When building our walls, we made sure there were cargo options galore. 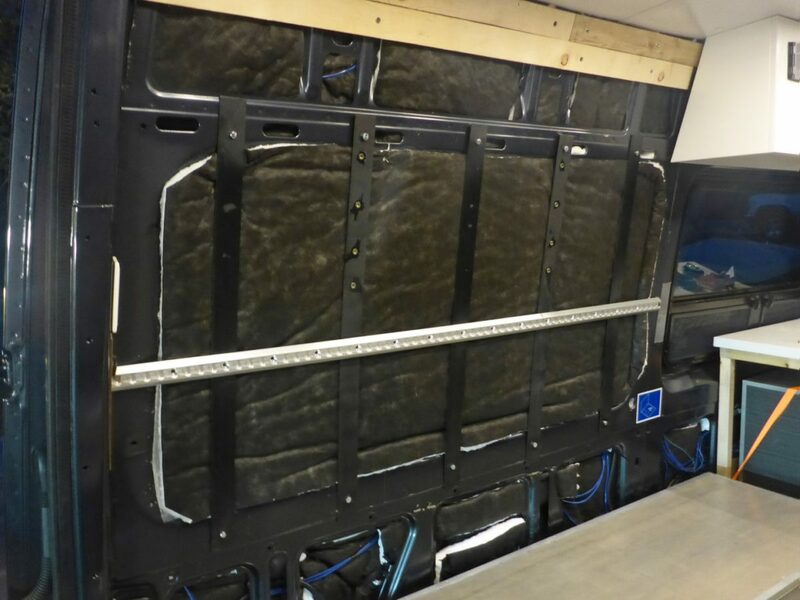 L track was installed in a few different locations of the wall to allow us to store the platform bed up and out of the way. 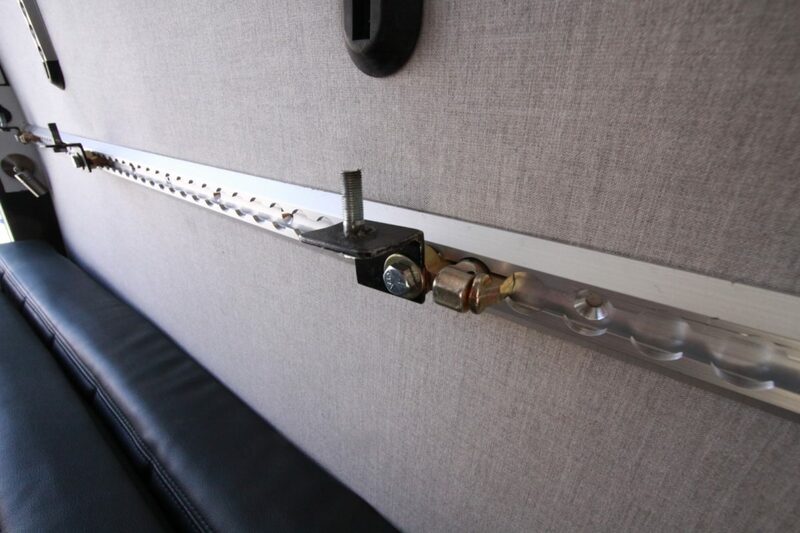 Four double stud L track fittings hold everything for the bed system to the wall. I cut four sections of ~5″ long, 3/8″-24 threaded rod and screwed them into the L track fittings. These mounts are removable and stow away in a canvas pouch. 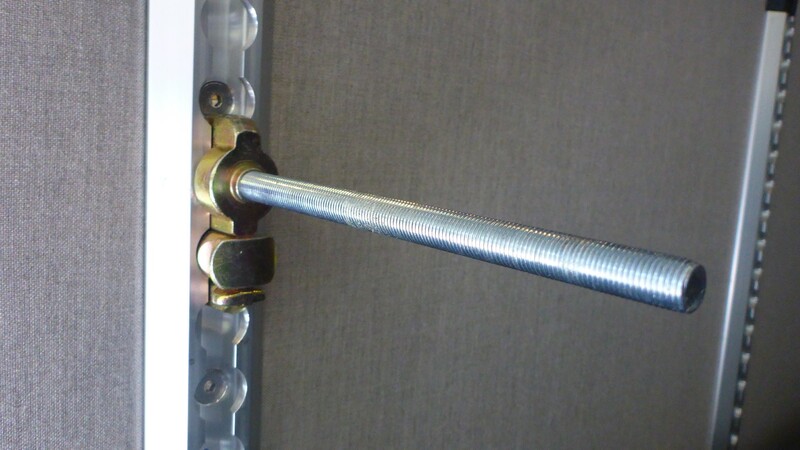 Thumb screws hold everything together without the need for tools. 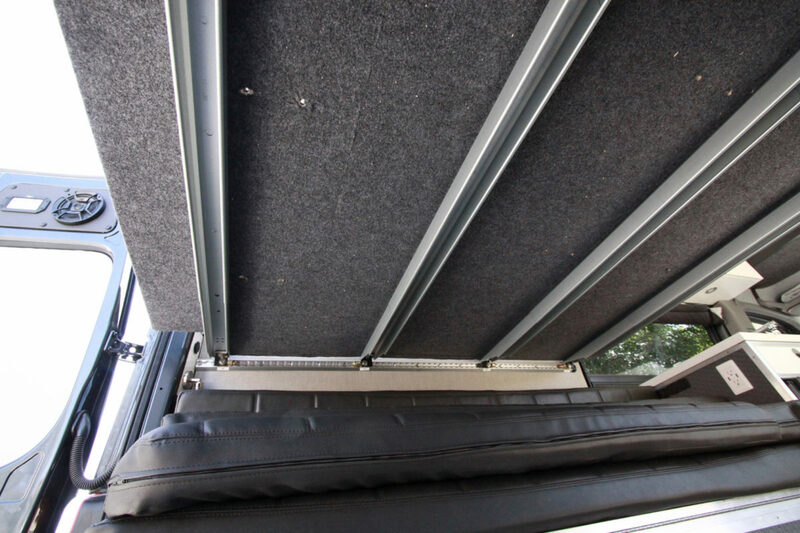 It’s nice not needing ratchet straps like some other panel bed bracket systems require. Another great thing about the way this platform bed stows away is that is doesn’t stick out very far. Since we store our cushions on the dinette bench, everything is a very low profile when on the wall. This makes it very easy to load our dirtbikes. 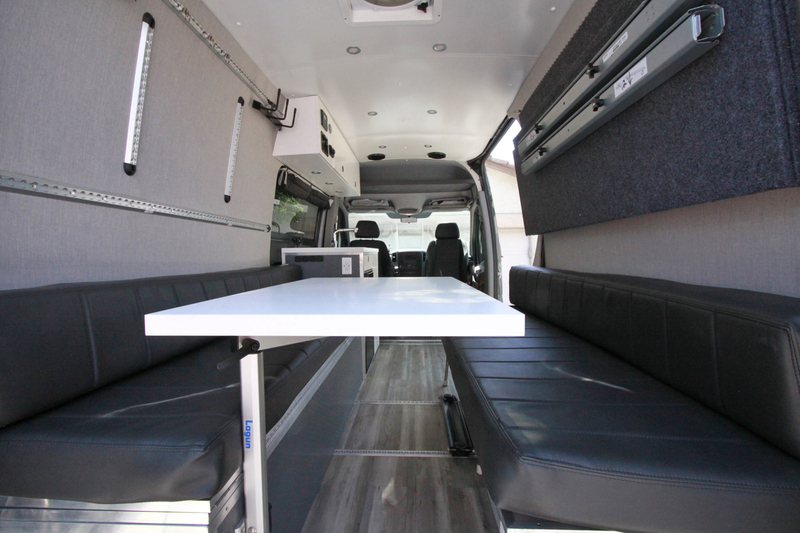 Even when our van is in the dinette configuration, the platform bed is well out of the way. 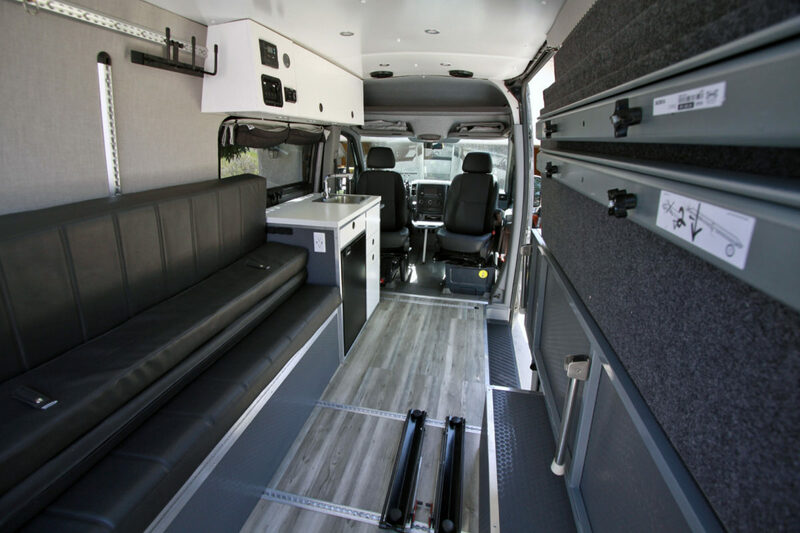 Many of the platform beds I see in vans require the front wheel to be taken off their bikes in order to be stored. 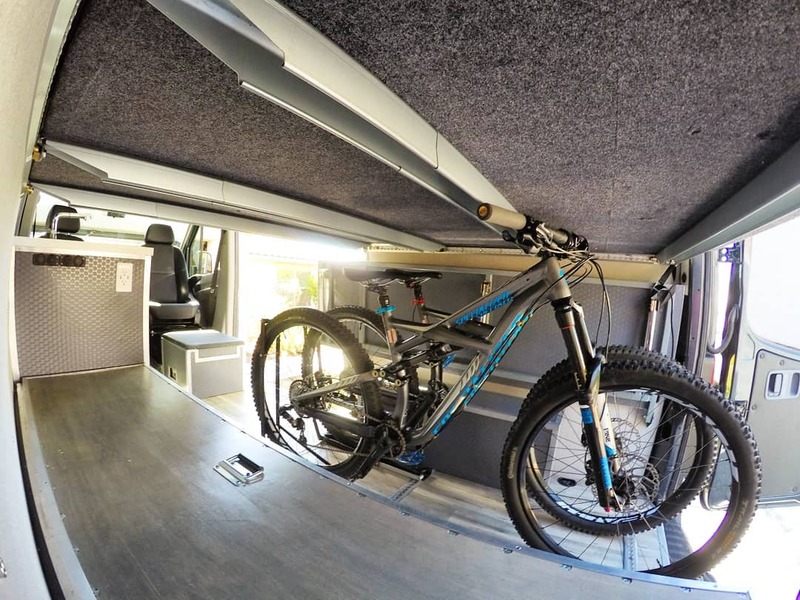 Yes, these setups offer more headroom and space in the bed, but it’s quite a hassle having to reassemble your bike every time you want to quickly pull them out to run into town or go on a ride. 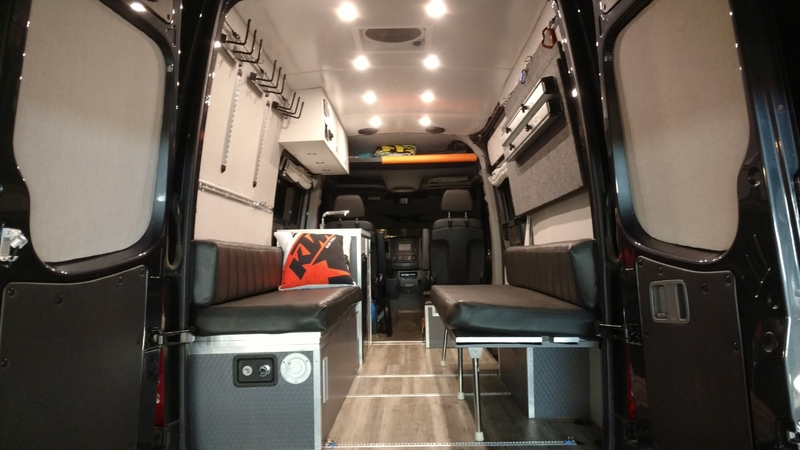 We positioned our 1UpUSA bike trays in a way that our bikes sit backward in the van and the handlebars clear the bed supports. It is a tight fit and they require a little lean to the side to pull them out past the last bed beam, but the beauty of it all is we get to leave our front wheels on. 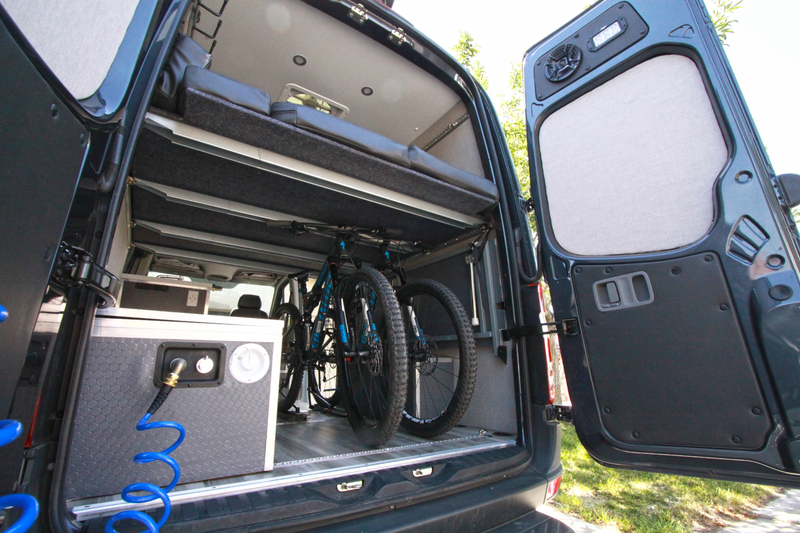 Shown here is our large and medium Specialized Enduro 29er bikes stored IN the van without having to remove any wheels. 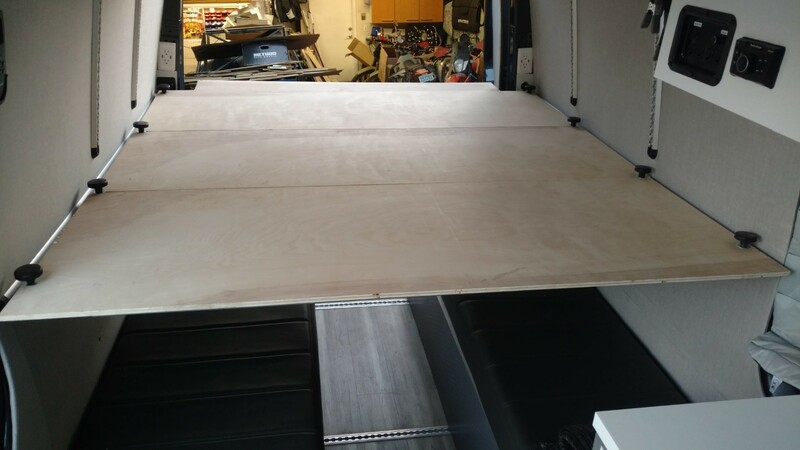 Our platform bed has been fully tested and it passes in every department. Thumb screws to secure panels & braces to the wall. A smaller option is sometimavailablebel too. 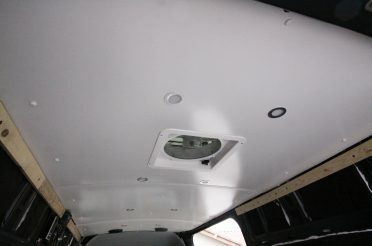 Sprinter Van Ceiling Install: White, Clean, and Simple! very nice!!! 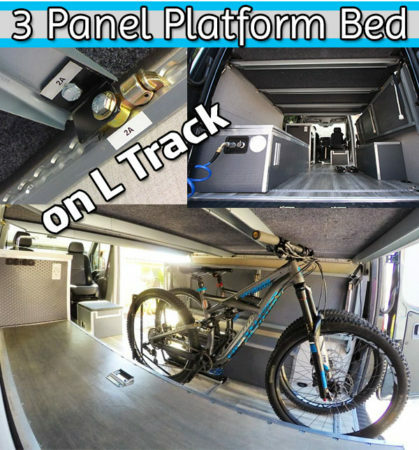 For my future Sprinter project I was thinking about l tracks to install the bed too. 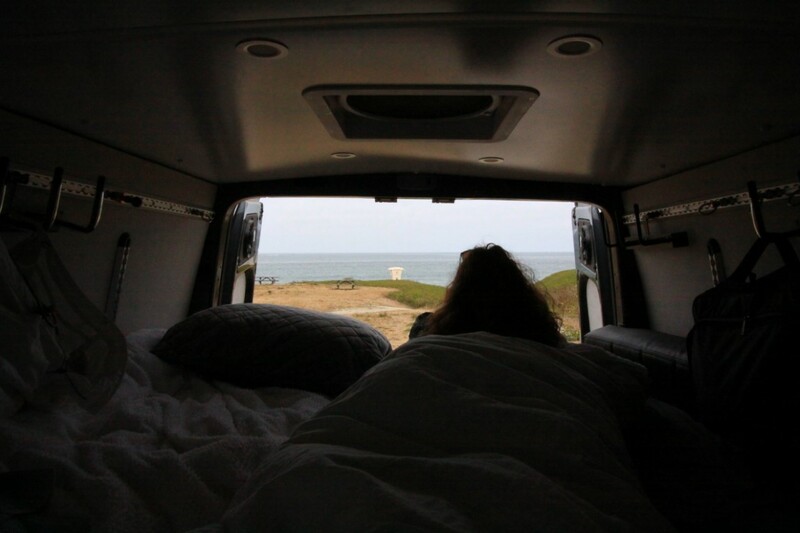 This comes very near to my own thoughts. Low costs, nice clean look, seems quite stable too. I am thinking about a diagonal l track in the middle of the car. 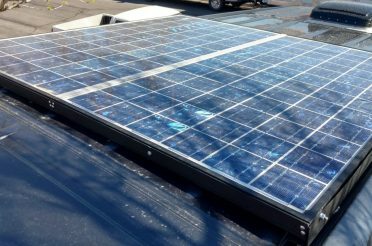 That can hold one of the panels as a backrest. Together with another horizontal panel in front of it that could be a nice lounge / bench for a rest. 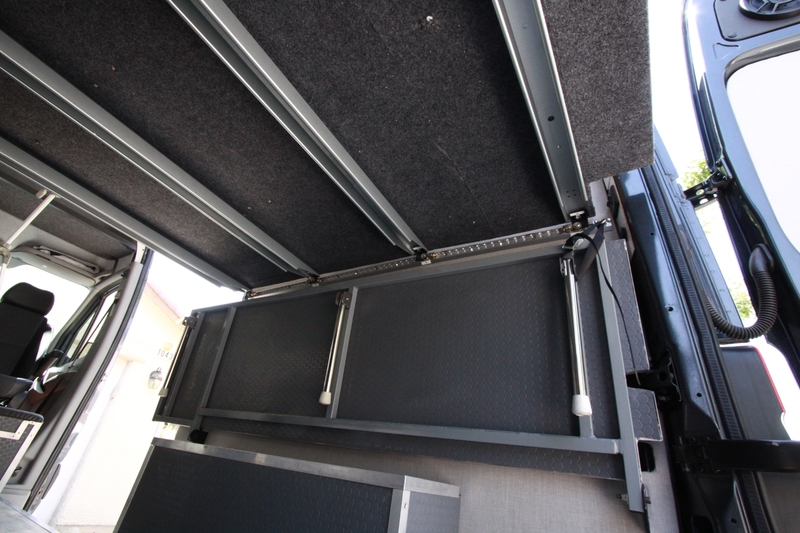 The storage is even a much better solution than any production bed from the famous companies! Love the setup. Can you tell me how tall your bikes are? 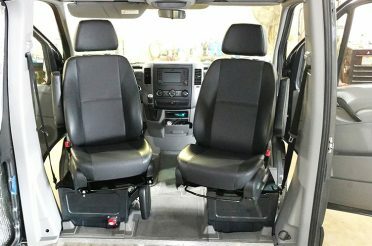 I am interested in knowing how they compare with a motorcycle I am looking to do something similar with. Thanks! Hi Leslie, the top of our handlebars is about 42″. That is higher than most motorcycle seat heights, but the handlebars of my KTM motos are a bit higher than that. 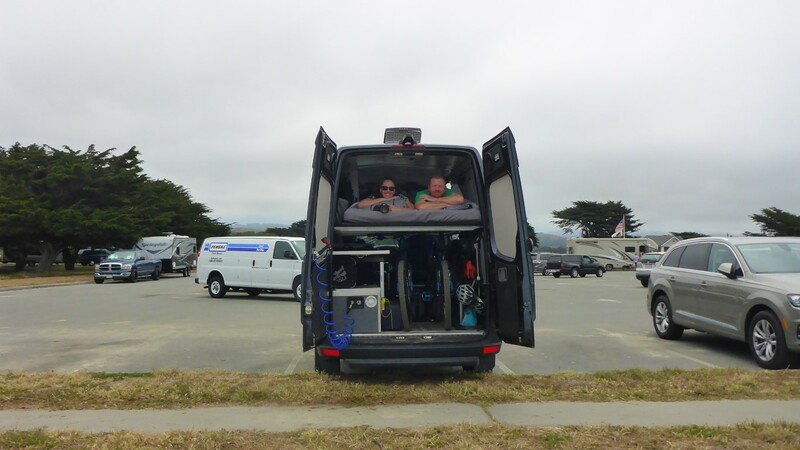 When we haul our motorcycles, we don’t use the platform bed. 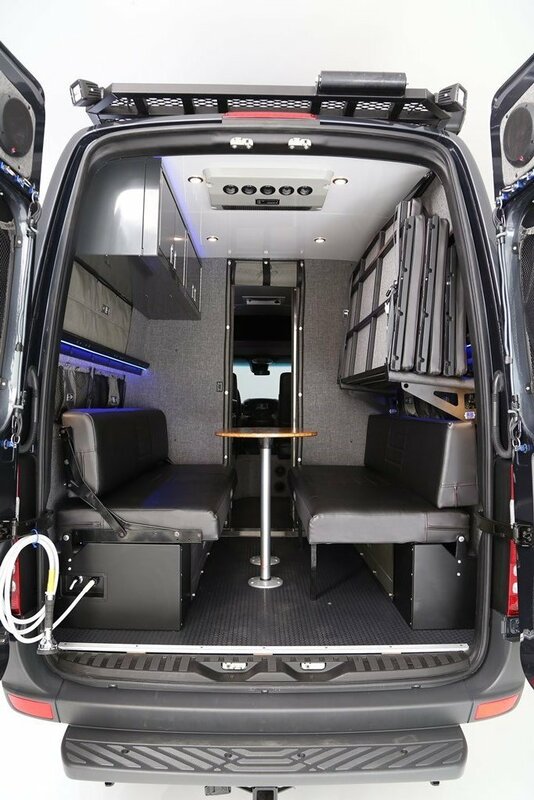 We could make it happen in a pinch and have them stored in a way that the bars were in front of the platform bed, but it would be pretty cramped.